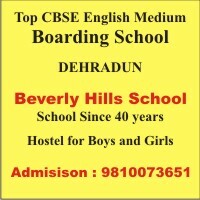 DAV Public School, DehraDun is a co-education English Medium School started by the D.A.V College Committee to cater to the president demands of the people of Dehra Dun. The school started with classes from Nursery to VI in its first year(1989) and now at the end of the 2008-2009 academic session we can boast of having a strength of 2000 + children. The school has a beautiful building in a pollution free environment with large play grounds. Well equipped computer IT, H.Sec., Science laboratories library & Qualified teachers provide holistic education to the future citizens of India. The school helps each child to develop his/her capacity and inborn talent to the fullest extent for which co-curricular activities are an indispensable part of school life. All school children, from Nursery to Sr.Sec have to participate in various games and activities.